I awoke before dawn on August 27, 1960, bursting with nervous anticipation. This was to be the most exciting and longest day of my childhood, if not my whole life. Given how wound up I was, I’m surprised I slept at all, and that my parents didn’t gag and tie me up in a suitcase. This day started in Innsbruck, Austria, and ended in New York City, some 24 hours later. It was a one-way trip, and several modes of transportation were involved, the most important and memorable one being this Swissair DC-8. Prior to that day, I had never even seen a jet transport plane, and now my family and I would be flying in one, to a new life in America. 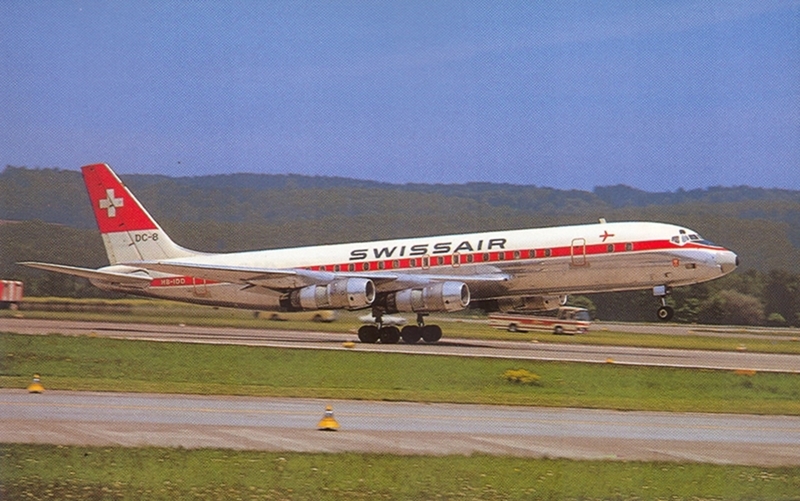 Swissair had just taken delivery of their first two DC-8-32s, one in April (HB-IDA above) and another in June (HB-IDB). The years 1959 and 1960 were the grand take-off of the jet age; every major international airline was receiving their first true intercontinental jets, either the Boeing 707 or the Douglas DC-8. The two makers were fighting for supremacy of the skies, a battle that took several decades to play out. It didn’t really matter to me which one we were going to take, but it has left me with a soft spot for the DC-8 ever since. Leaving aside the sad story of the DeHavilland Comet, the ill-fated (and considerably smaller) first commercial passenger jet, the jet transport era was ushered in by Boeing’s bold gamble to build a four-engine prototype, the 367-80, that would serve both to secure an order from the Air Force for tankers (KC-135 Stratotanker) and transports (C-35 Stratolifter), as well being the basis for a new commercial jetliner (Boeing 707). The 367-80 was announced in 1952, and first flew in 1954. Thanks to the -80, Boeing had a head start on developing the 707, although a number of changes were required. The most significant one was widening the fuselage, since the -80 was designed for only five-abreast seating, as was the initial proposal for the DC-8. But with jet engines growing quickly more powerful, Douglas settled on a 147″ fuselage for six-abreast seating. Boeing followed suit, and American Airlines President C.R Smith insisted that the 707’s fuselage be one inch wider than the DC-8’s.The re-tooling for the wider 707 cabin cost Boeing a huge amount of money. The 707 went into commercial service on October 26, 1958 by Pan Am. 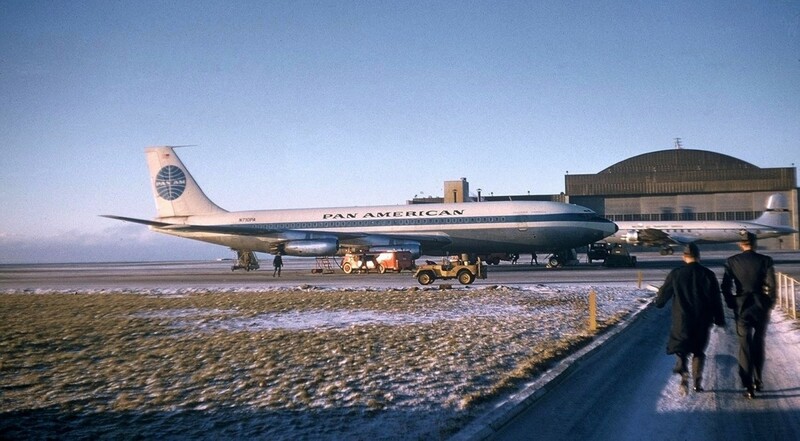 This shot, taken in Reykjavík, Iceland, in late 1958, shows one of these early 707-120s being refueled, as the first generation 707s and DC-8s were not not true intercontinental jets. The slim Pratt and Whitney pure-turbojet JT3C-6 engines are also a distinguishing feature of many of the earliest series of both of these transports. The JT3 even required water injection to develop enough take-off power. This article is about the DC-8, so we’ll leave the 707 for another time, but I will say that it is the somewhat more handsome airplane of the two, owing in part to Boeing’s decision to use many small windows, which makes the 707 look bigger in comparison, as well as sleeker. If we had flown a few months earlier, it would have been on this DC-7C, the final plane in Douglas’s long line of piston-engined propeller transports that started with the seminal DC2 in 1934. Douglas was the dominant producer in the post-war years, and was not in a rush to jump into the jet age, as it assumed the transition would be over a longer period of time, with turbo-props in between. The Boeing -80 changed all that, especially when the tanker jet contract went completely to Boeing, Douglas having assumed that it would be split with them. So Douglas scrambled to design a competitive jet. The DC-8 was announced in July of 1955, in four version, all of them with the same 150′ fuselage length. Seating capacity varied from 124 in a mixed-classes configuration to 176 in all-coach. 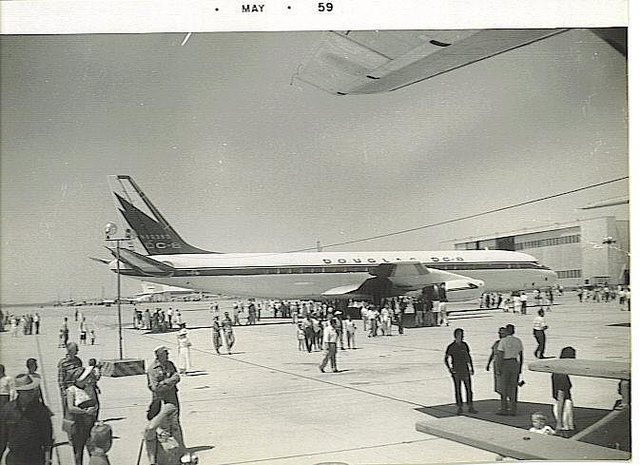 The first DC-8 rolled out of the new Long Beach, CA factory in April of 1958. 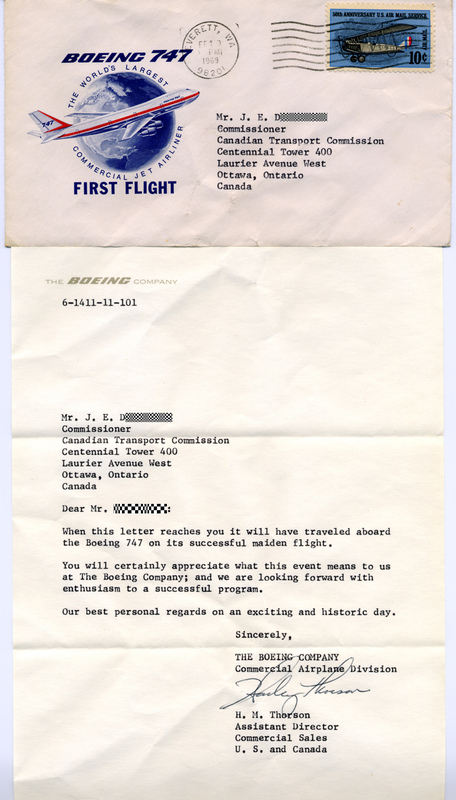 Douglas dedicated the first ten planes to certification, in order to speed up the lengthy process. The first commercial flight was by Delta on Sept.8, 1959, or almost one year behind the 707. The first order for both the 707 and DC-8 was by Pan Am, which boldly ordered 25 DC-8s and 20 707s in 1955, so as to encourage both makers, and allow it to hedge its bets. As it turned out, Pan AM soon sold its DC-8s and became an all-Boeing airline. But initial sales for the DC-8 were good, and by early 1958, Douglas had 133 orders to Boeing’s 150. 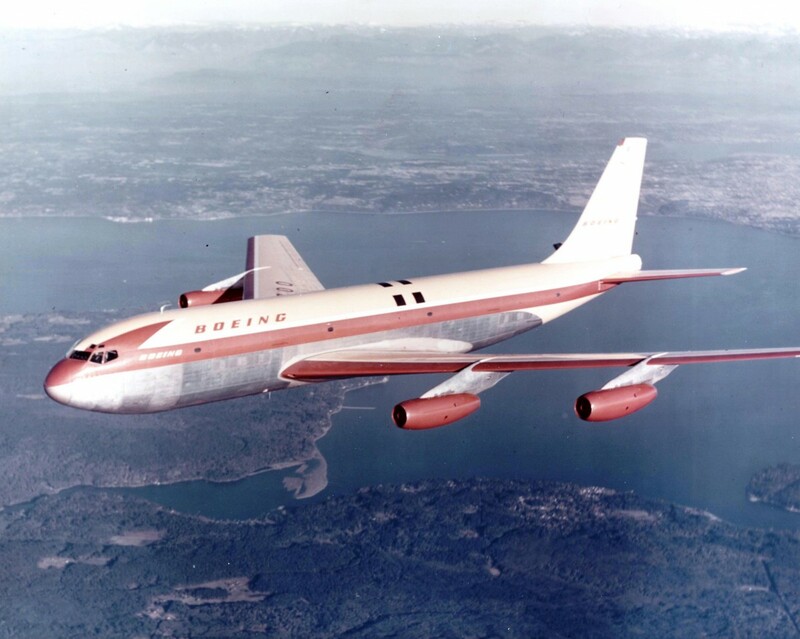 But Boeing was more flexible in creating different fuselage length versions of the 707, while Douglas stuck to just one. Boeing offered to build a short a 10′ shorter 707-138 for Quantas. And an 8′ shorter 707-020 with lighter weight designed for medium haul flights became the very popular 720. An 80″ stretch was employed in the definitive intercontinental 707-320 series, making a total of four fuselage lengths. This alone allowed Boeing to move ahead in sales, especially after DC-8 sales started to drop off after 1962. Back to August 27, 1960. We had to catch a train to Zurich, and I can’t remember if we walked to the train station or took a taxi. Probably the latter, since we had suitcases, but given my father (on right), I wouldn’t bet on it. 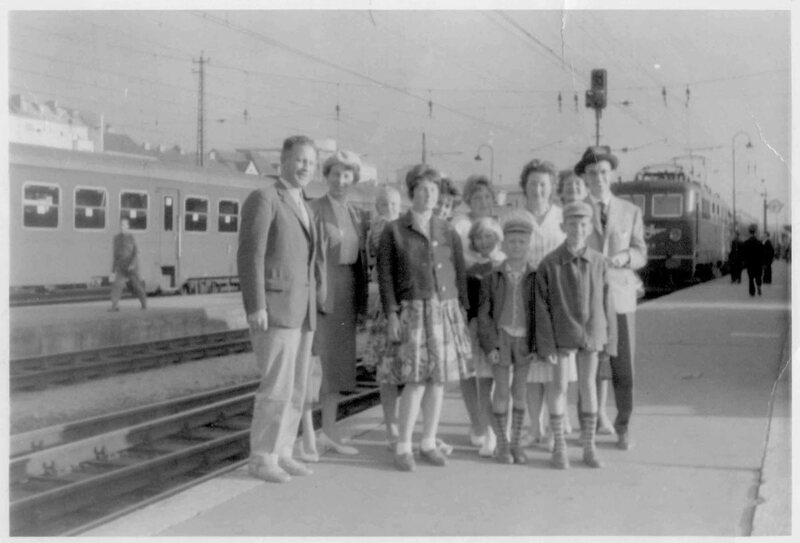 Here we are at the train platform, along with some of the friends and relatives that came to see us off. This was a very emotional day for everyone. Back then, there were no assumptions about ever coming back for visits; it had the air of finality to it. My grandmother was too upset to come to the station, and my mother (second from left) was not looking forward to it at all. My father had been recruited to the University of Iowa Hospital’s EEG Lab, and he had been to the US as a POW and loved it, but she was very resistant to leaving her hometown and family. My older sister (holding my 16 month old younger brother) as well as my older brother (front row right) were old enough to realize that the social transition was likely to be difficult. Only my father and I (front center) were truly gung-ho about this move. America, yes! It was hard to even imagine what America would be like, but I knew that the cars were going to be very different. 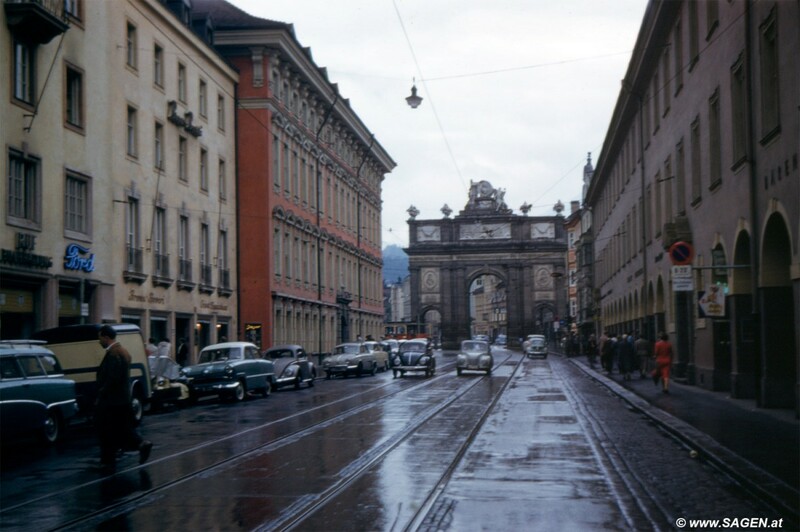 Here’s what the streets of Innsbruck looked like in 1959: VWs were “standard sized” cars, and Fiat 600s were a “compact”. We didn’t have a car , nor did anyone in my large extended family. We walked, or took the street cars and trains. 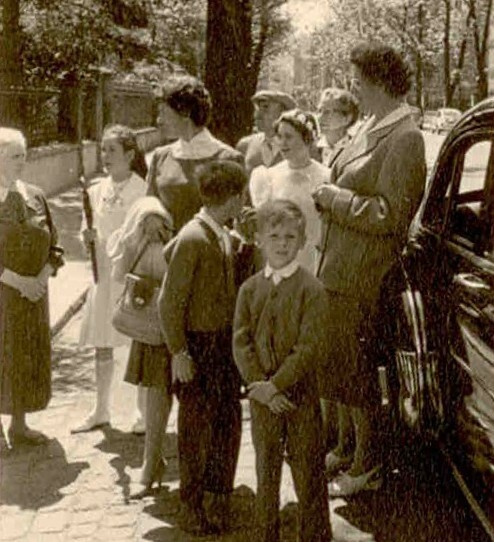 If we wanted to go somewhere by car for a special occasion, like this confirmation outing for my sister and cousin, we hired this 1949 or 1950 Olds taxi, and we ALL piled in, somehow. I’m thinking...can we just get going already? There were a few American cars to be seen from time to time, driven by tourists. This Studebaker coupe, flanked by two Fiat Topolinos, undoubtedly falls into that category, especially since it is in the Alt Stadt (old city). 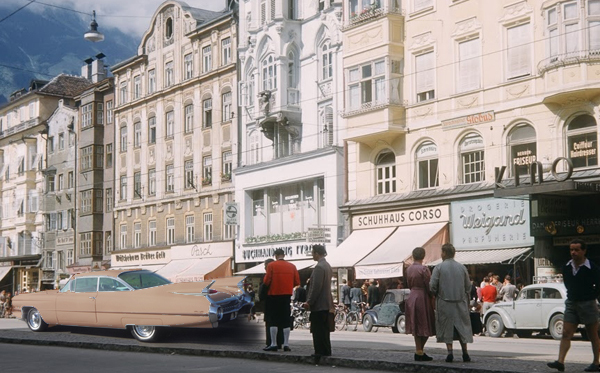 I had an encounter with a ’59 Cadillac on the street (re-enacted here thanks to PS), just a few months before we left, that created the expectation that America would be wall-to-wall with these winged wonders, or comparable. That encounter whetted my appetite; no wonder I was eager to go. And so we did. 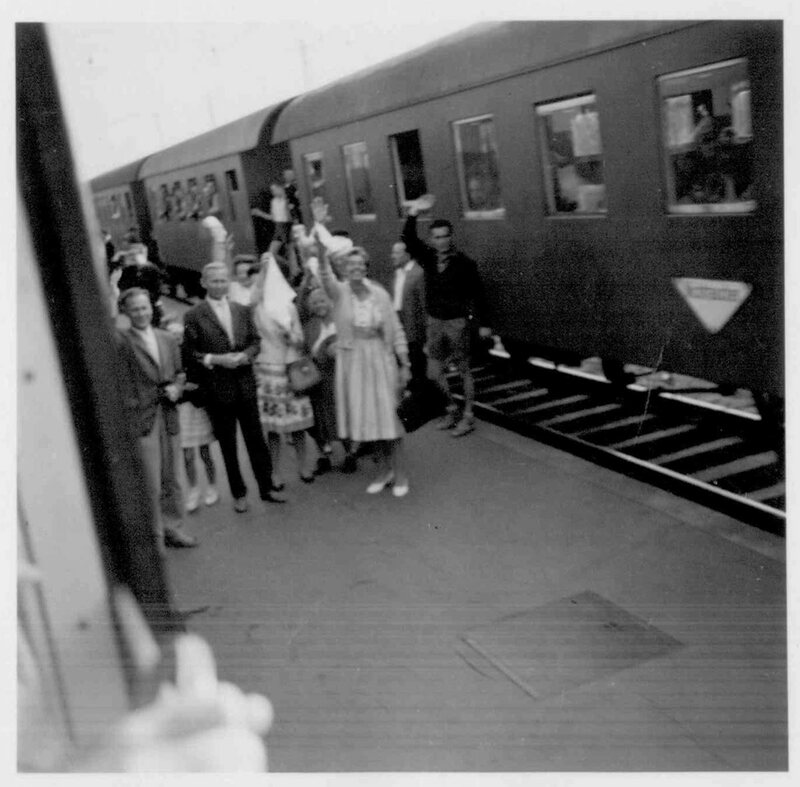 This shot was taken by my father from the train as it pulled away from the station and our relatives and friends. Would I ever see them again? Not until 1969, by which time my enthusiastically-waving aunt in front and one of my uncles would both have died, quite young. I’m not sure how long the trip to Zurich was; maybe three or four hours. 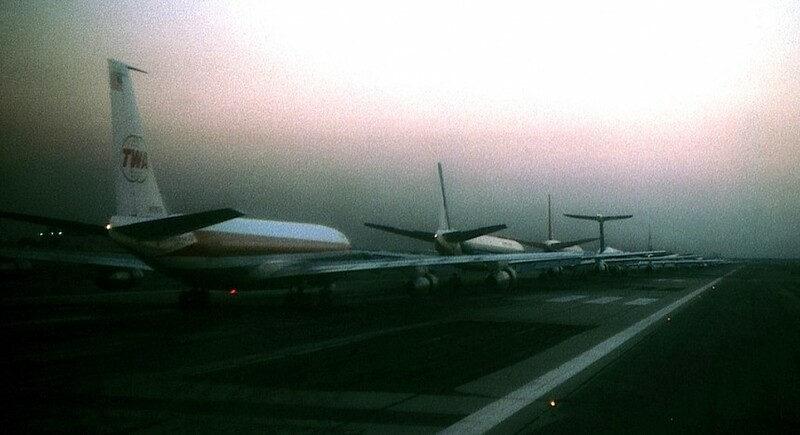 We took a taxi to the airport, where there was not one, but two DC-8s on the ramp. That turns out to have been their whole fleet at the time. This picture was taken by my father from the airport’s viewing deck. 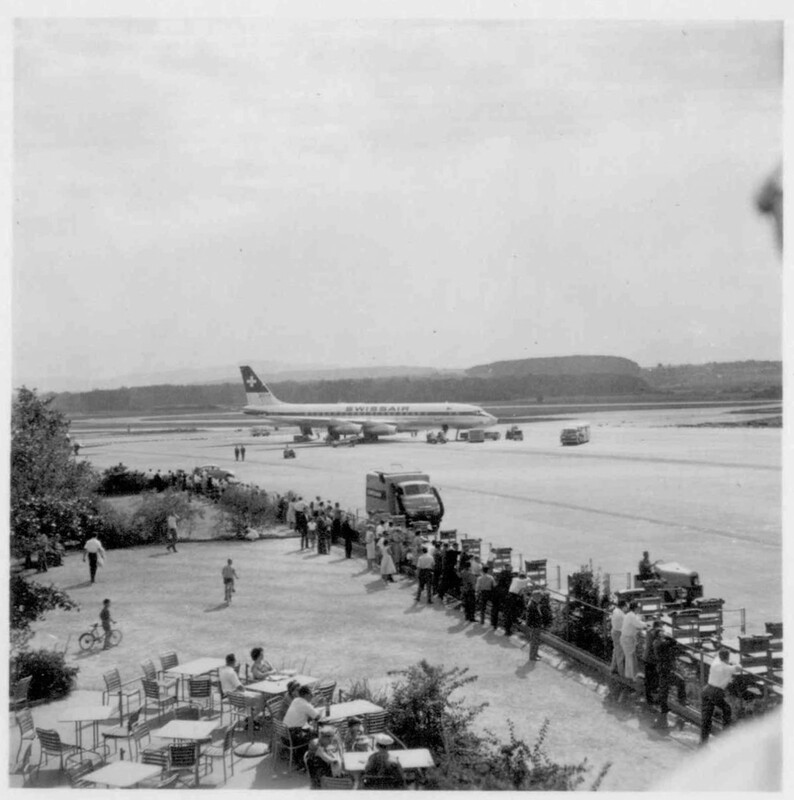 I had never seen a jet transport before; the biggest plane that had ever landed at the Innsbruck Airport back then was a DC-4, and my brother and I rode our bikes out to see it, at my father’s urging. Seeing that DC-8 out there, and knowing we were going to fly it to America was almost too much for my seven-year old synapses. We were several hours early, and while we waited, the other DC-8 took off, in what seemed a radically steep ascent (photo not from that day). Smoke billowed out of the engines, which was typical of these old pure-jet designs. Pure turbo-jet engines derive all of their thrust from the rapidly expanding burned gases, which made them inefficient at low altitudes and short flight durations. Already by 1959, a new generation of bypass turbofan engines such as the Rolls Royce Conway and the definitive P&W JT3D were coming on line, where a substantial part of the thrust was derived from a ducted fan that usually sat at the front of the engine. This DC8-53 has JTD3s, as can be seen by the larger engine intake, and the gap for the fan output to exit alongside the actual jet engine, whose turbine drives the fan. Turbofans were quieter, more powerful as well as more efficient, and, some airlines converted their “straight pipe” turbojets to turbofans, depending on their usage. On long flights, the difference in efficiency was not that as substantial as it was on shorter hauls. 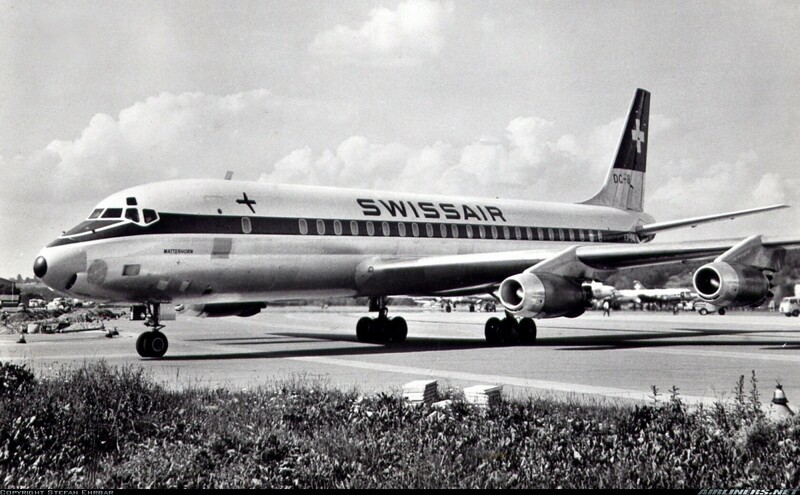 I’m not 100% sure, but I’m inclined to think that Swissair used a 2+3 seating on those early DC-8s in coach. Swissair always had a rep for superb service and comfort, and they only used nine seats across even on their 747s, instead of the normal ten. But I could be wrong. I do know that my father and brother and I sat on three seats on one side of the aisle, and my mother and sister and baby brother on the other side, in their laps. 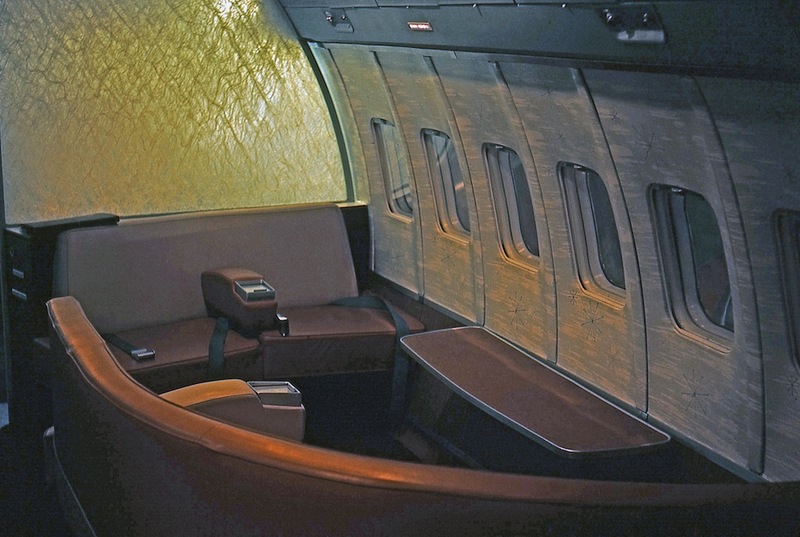 In any case, the unusually large windows in the DC-8 were a boon, as long as the original 40″ seat pitch was maintained. 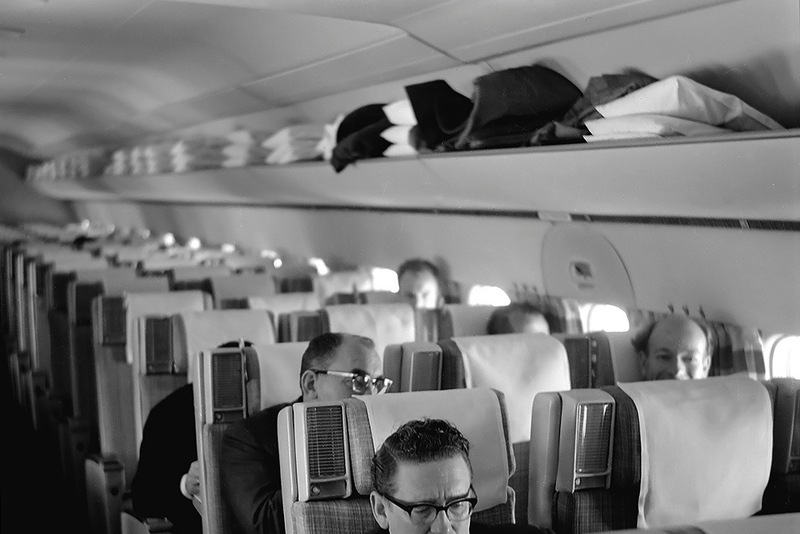 Most domestic flights soon changed that to 34″ or so, which meant that the windows didn’t line up anymore, and every fifth seat had no window at all. In retrospect, that was a mistake, and a substantial advantage of the 707, unless you got a window where it belonged. The views were stellar, and I remember the three of us fighting for turns at the window. And the leg room with 40″ seat pitch is something I can only dream about nowadays on regular coach. 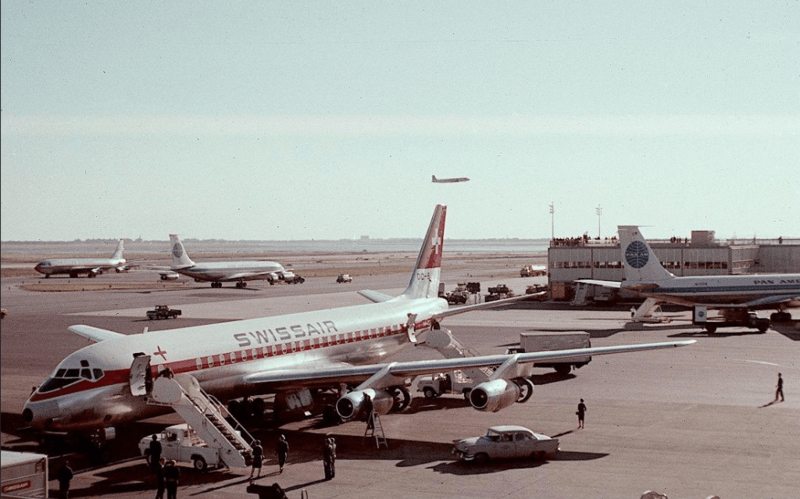 Even though Swissair’s DC8-32 was technically an intercontinental jet, with the more powerful JT4A engines and a range of 5300 miles, our flight stopped in Shannon, Ireland to refuel. This was quite common then, especially on westbound flights, which usually had strong headwinds. Gander, Newfoundland was another popular refueling stopover. I found a few pictures of that day, and I know there was also one of us on the airstair of our DC-8 in Shannon, but I couldn’t find it. This one one is from the web, taken there in 1961, with folks getting back into their Constellation. I vividly remember seeing a Conny or two in Shannon when we were there, as well as a DC-7. Old meets new. We arrived at Idlewilde Airport (now JFK) late that evening, after dark. The tropical warmth and especially the humidity of an August evening was a shock, having never experienced that before. It added to the surreal quality of arriving at this giant airport, with jets and planes from all over the globe. After some delays going through Immigration, we were met by some distant relatives of my mother’s who had long lived in New York. The first car I saw as we exited the terminal was a big 1960 Pontiac. There was a psychedelic quality to the whole experience, a result of the sensory overload; the smell of kerosene from the jets, the heat and humidity, the giant airport and giant cars everywhere. I’m not in Innsbruck anymore. I wrote about our arrival to NYC and the three days we spent there with our relatives here. It was a quick and deep immersion into all things American. And I started assuming all of America was going to be one endless New York City. We took a United DC-6 to Chicago, and then transferred to a Convair (340, presumably), a twin engined prop plane designed to replace the venerable DC-3 on shorter hauls. This picture of my sister, baby brother and mother deplaning in Cedar Rapids was taken by the folks who picked us up, my dad’s boss to-be. They drove both of their cars to pick us up; he in his 1956 DeSoto, she in her 1949-ish Plymouth station wagon. Naturally, I had to ride in the old wagon. Thus ended the trip of a lifetime for me. Iowa was hardly like New York, but at least there were cars. The new 1961 models were just coming out, and I quickly become inducted into the cult of GM. Douglas did eventually stretch the DC-8, by almost 37 feet, for the Series 61 and 63, but that wasn’t until 1967, by which time Boeing was finalizing their jumbo 747. 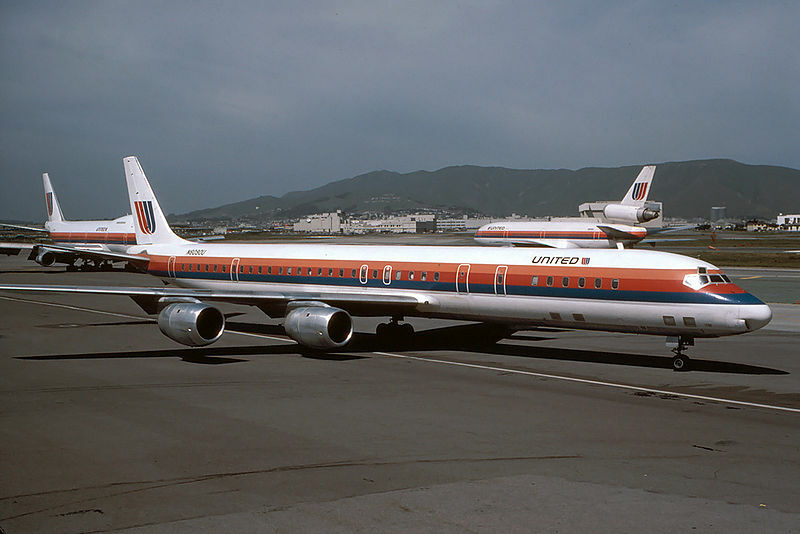 Seating was up to 259 in a high-density configuration, and these airliners had a long life, not only with United, who used them extensively, as well as with freight haulers. Some are still at work today. My next DC-8 flight was on one of these Super -61s, in the summer of 1968. I was fifteen, and managed to talk my parents into letting me fly back to Iowa by myself to visit friends from grade school, having moved to Baltimore in 1965. I took an early morning flight from Baltimore to Chicago on one of these DC-8-61s, and there were no more than twenty passengers that day. It was bizarre, sitting in such a long plane, and only a few heads to be seen anywhere. Such were the days before de-regulation. That trip was memorable too, as you might imagine. I had just written my friends I was coming on about a certain day. I hitched a ride from the Cedar Rapids airport to Iowa City, with a congressman coming home for the recess, no less, whom I had seen on both of my flights. And when I got into town, I just walked to my old friend’s house, knocked on the door, and said…here I am! After a couple of weeks hanging out and getting into a bit of trouble, I took a Trailways bus down along the Mississippi to St. Louis, to visit another friend who’d moved there from Baltimore. I learned to enjoy my freedom at an early age. And then I flew home on a TWA 707. I was flying student stand-by, which meant I boarded last. As soon as I got in, I saw that the front first-class lounge was empty, so I just plopped myself there. The young (and hot) stewardesses didn’t care less; in fact, they all sat there chewing gum and reading paperbacks once they were done serving the excellent lunch. And I stared at their long legs. I tried to get them to give me a beer, but that’s where they drew the line. Oh well. The next trip on a jet was back to Europe for an extended summer vacation in 1969. But it was a charter, and the plane was stuffed to the gunnels . By now I was spoiled, and have mostly blocked out the memories of that crowded, hot flight, including sitting on the runway at JFK for over two hours because of an air traffic controller’s work slow-down. The golden days of jet travel were already over, for me anyway. In the early eighties, many of the remaining DC-8-61s and -63s were re-powered with hi-bypass CFM56-2 engines, which made them significantly more efficient. In 1989, we were headed to Baltimore again, this time from San Jose, and somewhat surprisingly, United flew us to Chicago on one of these, in the final year or two before they were sold off, many to UPS. Its interior was a bit ratty, and it felt old, but it was a great flight down memory lane. 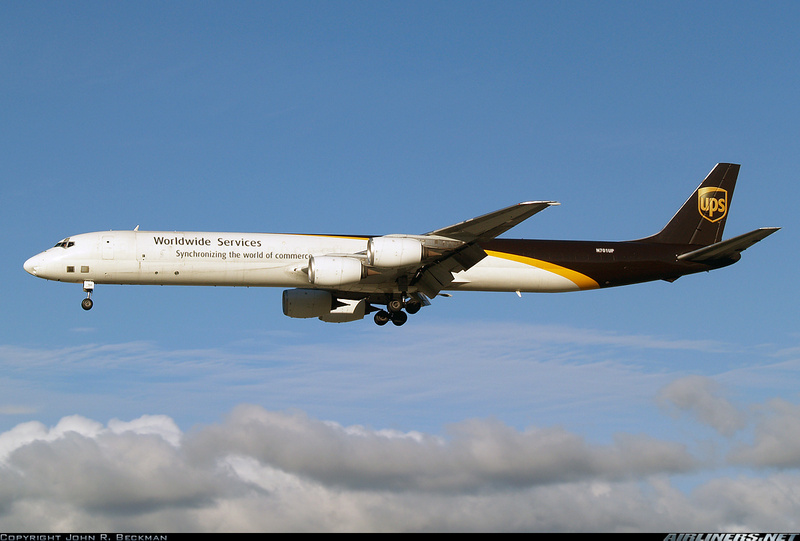 The last revenue flight of a DC8 in the US was on May 12, 2009, by a UPS freighter. UPS had had planned to keep flying them until 2015, but to the recession at the time, the fleet was cut back, and the old DC-8s were the first to go. As of 2013, there were still 14 of them flying in the more obscure corners of the world, although all are freighters. The DC-8’s passenger-hauling days are over, and even its freight hauling days might be over soon. It will be missed. I remember flying Ozark airlines from St Louis MO to Atlanta GA with my grandparents back in the early 80’s. 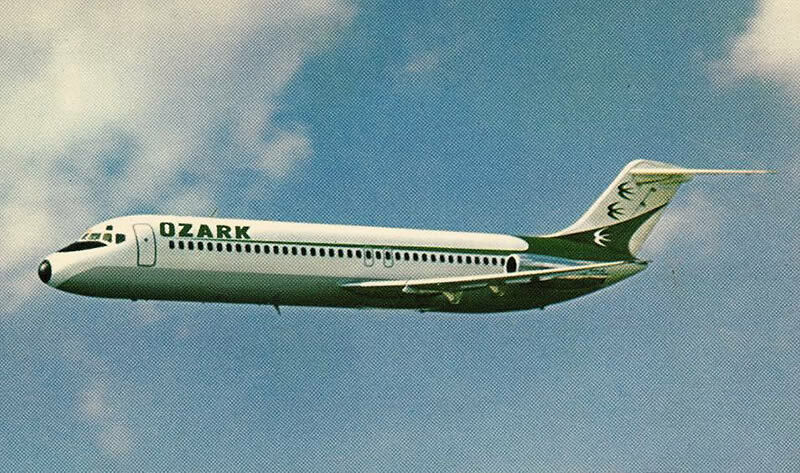 Ozark had DC-8s and DC-9s. Delta and Eastern had them too. Thanks for the memories. Ozark! Remember them well. I never flew on Ozark, but in my childhood through High School years, I spent summers at my Grandmother’s in Missouri. Flew TWA from San Francisco to St. Louis and all the TWA gates seemed to be on one side, all the Ozark gates on the other. Lots of Ozark planes! As an Ozark employee I once non-revved from LAX to OGG (Kahului, on the island of Maui) on a United Stretch DC-8 that had been retrofitted with hi-bypass engines. By the time we were purchased by TWA all the 707s had been parked but we continued to operate the 727s for quite a while, at least into the nineties. I last flew in a DC-8 in 1984, going from Toronto to Saskatoon. I’m sure it was near the end of it’s service life at the time. I especially remember the old 2-channel “air tube” headphones, a far cry from what we have today. As an aside, does the guy in picture 22 look like Don Draper or what? I too flew on a United DC-8 from Chicago to San Francisco. The orange/red/blue striped seats in coach. Tube headphones, too! This would’ve been around 1983. Good reading here Paul . 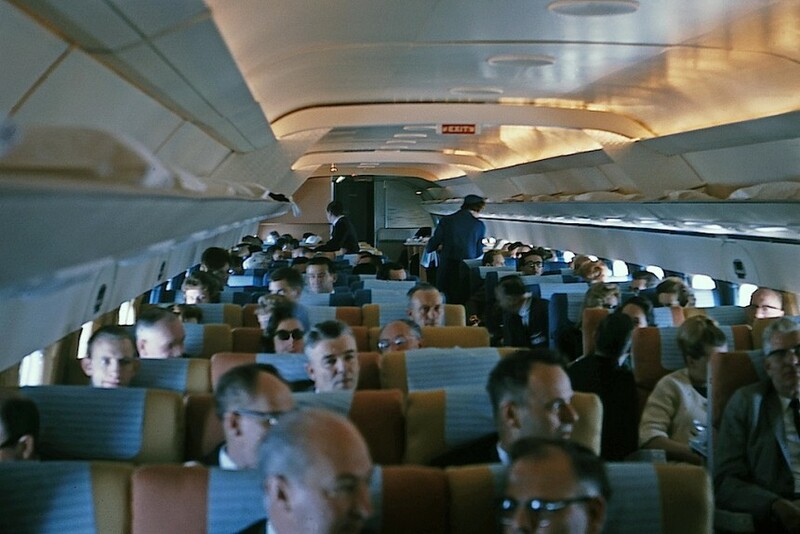 IMO , the Golden Age of Flying lasted into 1973 before I got crappy service and tiny seats . And lower fares. I just bought a ticket for my wife to go to Shanghai in March, for, get this, C $661. Flying was better in the old days, but it cost a lot more. Want old style service and pampering? Well, pay old style fares for business class. I never flew on one of these, but I did manage to bamboozle a stewardess into serving 15 year old me a drink. I was flying United Airlines from Richmond to Asheville in the summer of 1967. Our flight departed at 5 pm, the “champagne flight”. The gorgeous stew came around taking drink orders. Probably because I stood 6’4″ and was wearing a suit, she asked me, “And what will you have, sir?” I enjoyed my first champagne cocktail over the Blue Ridge mountains. Oh, and the dinner was excellent. Them’s was the days! Wow quite an experience I vaguely remember going to Whenuapai aerodrome to collect my Nana from her Fijian trips in the pre jet age and we did go to the opening of Auxckland international airport in 66, My mother witnessed the first international passenger flight landing in New Zealand, the travelled to Mechanic’s Bay in Auckland on my great uncles 35 foot launch, anchored, the watched the ex RAF Sunderland land on the Bay, airport? yeah nar not back then. Being from St. Louis, TWA was my airline, but ironically my very first flight was aboard a Delta jet to Houston then a Braniff jet to San Antonio to begin USAF basic training at Lackland AFB on Sept. 22, 1969. After coming home on leave after basic, my flight to California was aboard a proper TWA Boeing 707, just like in the photo above! Incidentally, returning from leave in January 1971, my flight from San Francisco to Sacramento was on a DC-8 stretch. That was a memorable 20 minutes, for Sacramento was sacked in by fog, as is common, but after hitting an air pocket and seemingly dropping out of the sky about a mile, the pilot announced that yes, Sacramento was fogged in, but he was going to land anyway! I was sitting at the front bulkhead in coach, and looking as far as the eye could see at all the empty seats, all 15 or so of us on board held our collective breaths! Well, we smacked down on the runway – the pilot came up rather short, so full reverse-thrusters came on, brakes were jammed on and everything that wasn’t tied down was thrown forward. I felt like I was going to go through the bulkhead! Anyway, we were all safe and the drama was kind of exciting! For what it’s worth, my flights to-and-from Okinawa were aboard KC-135s. We sat lengthwise in paratrooper-style web seats – see “Band of Brothers” and every other war movie featuring paratroopers because the interior accommodations were identical to C-47s! Only officers had airline-type seats, and the bunks aboard were for the flight crew and boom operator. We had to wear Mae Wests and carry an oxygen bottle with us at all times while in flight. The oxygen would have helped if the plane lost pressure, as was not that rare, but if we went down in the Pacific, even if we survived, I’m not sure a Mae West would save us for long before becoming shark’s dinner! 5 hrs. from Beale AFB to Hickam Field, 14 hrs. from Hickam to Kadena. Fun, plus we were expendable, but that’s another story! Oh… that Trailways bus? 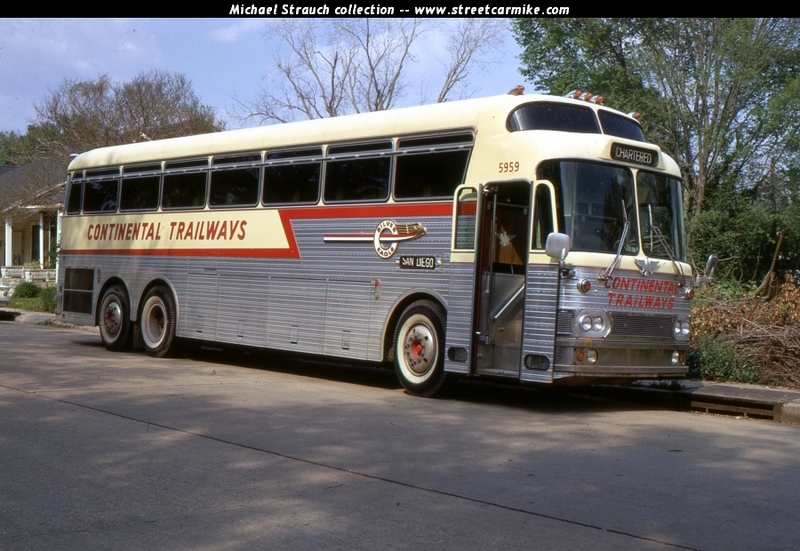 Wifey worked for Continental Trailways in the St. Louis garage as a secretary for 9 years and we still have a nice, large tinplate friction Trailways Silver Eagle toy bus! I believe I posted a photo of it a couple of years ago. I once did a UAL flight originating in SFO to Chicago by way of Sacramento. 18 minutes in good weather. Flight attendants didn’t even bother to get out of their jumpseats. Fast forward to 1999; same things on Delta from Cincinnati to Louisville. 18 minutes. Up/down/gate. That was on a DAL B-727, that had a Western Air Lines tail number (DAL acquired Western in 1987). There are excellent 1:50 scale die cast metal (aluminum I think) promotional models of the DC-8 originally made by Douglas for their airline customers. Often these were seen in airline city sales offices and sometimes at a travel agency. I have one in Alitalia markings and a second one as a United jet freighter. Paul, if you are nuts about these you can find them on the net but they are not cheap! Look on line for the “Fred Cox” collection of these DC-8 promos. 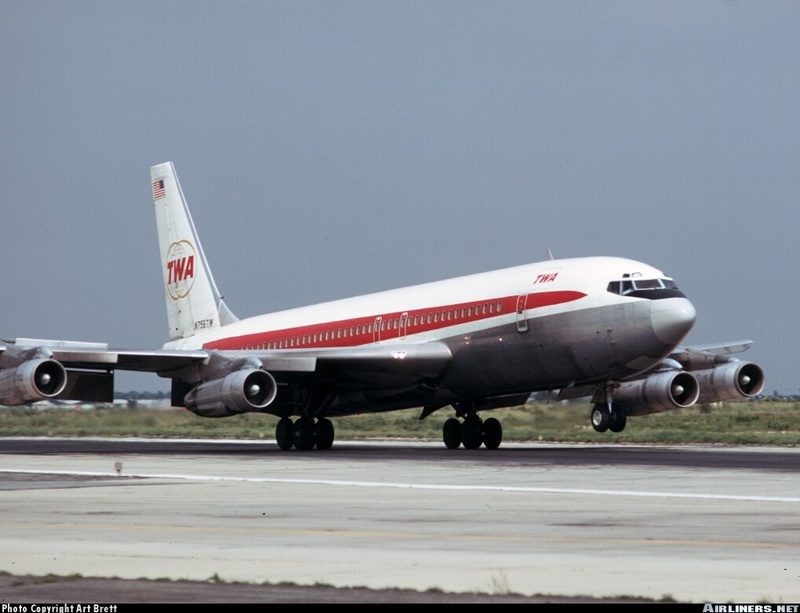 My DC-8 flights were not frequent; somehow I usually ended up in my early airline customer jet flights on 707s from TWA, American and Continental. However I do remember DC-8 series 60 flights from Denver to Portland (UA); Los Angeles to Las Vegas (UA); Montreal to Toronto (AC). I grew up in Marion, Iowa and remember the old Cedar Rapids Airport. Back then, there were no jetways, and I remember watching people having to walk out on the tarmac to climb a set of stairs to board the plane. That still happens at times; I forget what airport I’ve experienced it at, but sometimes to board the small regional jets there are no jetways and you have to walk across the tarmac. I also clearly remember doing this at Newark airport in 1985. We flew Peoples Express (remember them? an early low-cost carrier that eventually imploded or got bought out) and I’m pretty sure the plane was a 727. Sadly, I came along too late to fly a DC-8, or at least to remember it. Other than that one lone 727 flight in ’85, all my early flying experience was when I was too young to remember. After ’85 I didn’t fly again until 1996, by which time the DC-8 was long gone from passenger service. Walking across the tarmac still happens with Euroepan low cost carriers. 9 pm at Gothenburg, Sweden in December 2012, and it was -12C! Depends on the plane, really. Are you sure? We flew into (and out of) Pearson this summer. Both flights were Air Canada “Jazz” CRJs….and we used a jetway in both cases. I actually walked down stairs onto the tarmac in Beijing this year. I could hardly believe it. First long flight for me was on a clapped-out El-Al 707 in 1986, Tel-Aviv to Copenhagen where I boarded a Qantas 747 on the 2nd leg of a never-ending flight to Melbourne. I remember how posh the Aussie plane seemed in comparison to “ours”, already at the end of its role as a passenger plane; I believe it (or one of its sisters) was converted to an IAF tanker – I’m not sure, but they may still have one or two in service! Oh: Paul, the ÖBB kept one or two of those for special rail fans trains… Seen at Franz-Josefs-Bahnhof, Vienna not too long ago. I was thinking 1010. But it’s pretty hard to tell, given my fuzzy picture. 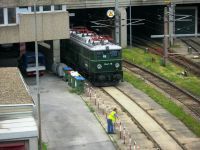 This train is coming down from the Brenner, and the six-axle 1010s and 1011s were used quite a lot there. 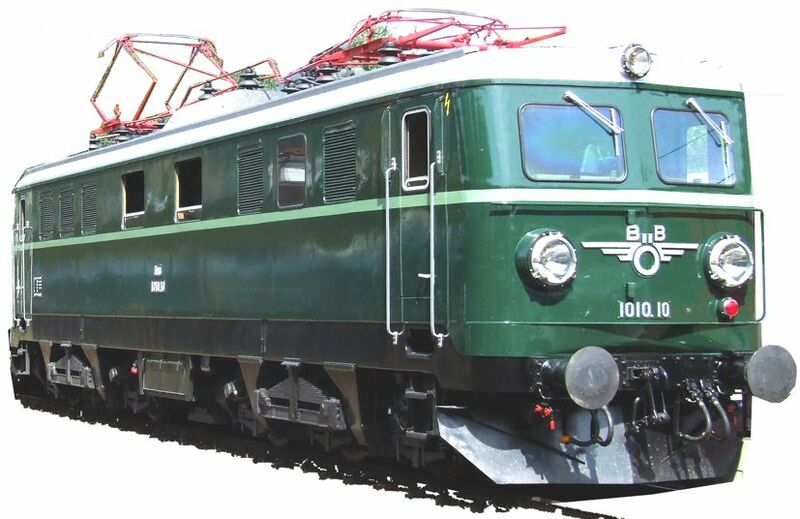 Sure – they are difficult to tell apart due to the ÖBB’s standartized body. I think there are still a few 1042 at Westbahnhof used as reserve. The 1010s are all pensioned off but some are preserved. Most of the older types like the 1044s are slowly being replaced by the 1116s (Taurus), an impressive beast by all accounts which, to me, is a future trackside classic. Living next to Westbahnhof I luckily get to see those and others on a regular basis. The US has always been the leader in the air but as far as rail passenger services Austria is among the best in the world. Vienna in my opinion has the best urban transport system in the world, and it’s not too expensive either, if like me you buy a yearly pass. Great story to start my day and morning coffee. Those are some great family photos. The first flight I remember was around 1965 from Portland to LAX to visit my grandparents with my mom. I have no idea what jet it was except it had four engines, it may have been a 707. In the 90’s I was once on a early 737 with the loud slim engines. Once I was on, I believe, an MD80 with the 2 rear engines, I was sitting in the back and it was loud, though I imagine quiet up front. Also arrived in the pouring rain and watched my parents drive around the pickup area in PDX twice driving right by me, mom and dad looking straight ahead as I yelled and waved. They did the same on the third loop, I ran out in the road yelling and beat my fist on the trunk of the car, dad slowed and as I ran up to the passenger side mom finally turned her head and they stopped, by this time I was soaking wet! Two ‘incidents’, both on later 737’s happened in the mid 90’s that I’ll never forget. The little flaps that stabilize the plane when landing, I don’t know what they are called malfunctioned, the one by the window on the left side where I was seated popped up crooked and jammed in that position, these are the flaps that come up when slowing down to land and I assume help keep the plane from rocking. I pointed this out to the passenger sitting next to me, nothing was announced by the pilot and we landed safely. But before we got off the Captain was standing under the wing next to a mechanic pointing to it and yelling at him. The second ‘incident’ on another flight was as we were coming into Burbank Airport the Captain announced that the runways were really short at this airport, and we would land hard and stop rapidly. I had flown to Burbank several times in the past, and never got this announcement before. The plane landed with a solid thud, and the plane braked really hard, the ABS was vibrating and the whole interior was shaking with a loud plaaaaaaaaaaaa sound. The engines never hit the reverse power mode, they never revved up, it was all brakes. As we stopped you could see and smell the burning rubber smoke as it drifted up to the windows. We taxied to the unloading platform and got off normally. Must have been some kind of engine problem that would not allow the engines to reverse. Last time I was on a plane was around 1996. Great story Paul, you really need to write a book about cars or planes. Now I’m off to see how much the root plugged sewer pipes in my rental house are going to cost to replace. Talk about a let down! I can see how Austria to Iowa would be quite a transition. I wish I’d been more impressed by jets at an early age, so I could remember what I flew on for sure. My first few flights were from Nashville to the DC area, likely on American 727s. Then Presidential from Hartford to Dulles, which used the British Aerospace Jets. When I was in college I flew ValuJet a lot on it’s fleet of dodgy DC-9s. One plane had purple and blue seats and orange carpeting. Delta kept a few DC-8 stretches into the 90’s. Flew one between Memphis and Little Rock in about 1984. Seemed so much longer than the 727’s and DC-9’s I was usually on. Lived near the Nashville Airport 88-91 and remember seeing a Delta DC-8 Stretch usually once a day, along with a lone American DC 10. Was a treat to see one of them after the endless parade of DC-9’s, 737’s and 727’s at that time. 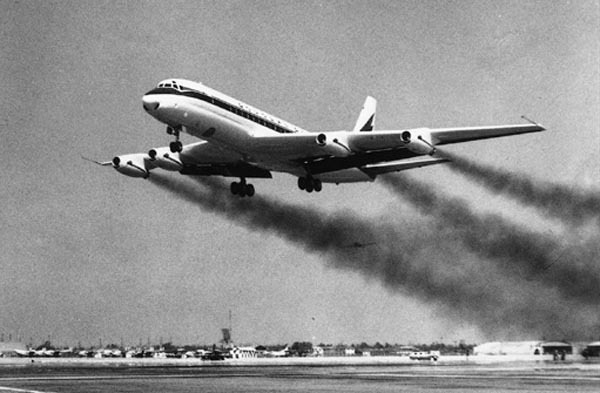 The DC-8’s were fitted with engines that had the same whine as the DC-10’s. The 757 kind of reminds me of the stretch DC-8 minus 2 Engines Great Read! In August of 1977 I flew with my brother to Europe — he in college, I was to be Senior in High School that fall. packed to the gills with other college-age kids. Charter-flight operations seem to be a long-gone memory, no? We left the PanAm WorldPort at midnight. A terminal that even then was overwhelmed, and worn out, by its volume of traffic. What I remember of the flight, aside from the noise of the other college kids all the way across to Amsterdam, were the brass fittings in the wash-rooms. Sink spout, faucet handles and, oddly, the toilet flush valve and seat hinges. The rest of the plane had been modernized at some point inside. I had been on only one other flight in my life before that — a 747. That had been modern, with nothing as old looking as this plane had in its washrooms. I remember also that the name of the charter subsidiary was reversed — Air Swiss. But I’ve no idea how old that plane really was. And by 1977, and in a charter, the food was definitely an ‘airplane meal’. Great story! I can only imagine the level of adventure that such a trip could be to a 7 year old. But your storytelling abilities help a lot. I recall flying as a youngster. The earliest flights were on propeller planes, and then on jets later in the 1960s. I recall getting “pilot’s wings” to pin on my shirt a couple of times. I wish I had kept them. I probably flew on a DC-8 once or twice, but was not enough into the planes at the time to tell the difference between it and a 707. I rode my first jet, an American Airlines Boeing 707, in 1958. Later that year I rode a DC-8, on National Airlines. The National DC-8 had 2-3 seating; the DC-8 was a tad narrower than the production 707 (which had been widened from its 367-80 original design to fit six-abreast) and most early ones were built that way. Market forces ruled, finally, and 3-3 got crammed into them. But that National DC-8 with 2-3 seating had more space for five abreast than did the Boeing for six, and felt more comfortable as a result, though its window curtains made the interior look older than the 707’s with its slide-down window shades, the design still used today. The widening of the Boeing fuselage has resulted in the same upper cross-section being used today in current production Boeing 737s, minus the “double-bubble” contour of the 707’s lower fuselage. I have a very slim recollection of my very first airplane ride . 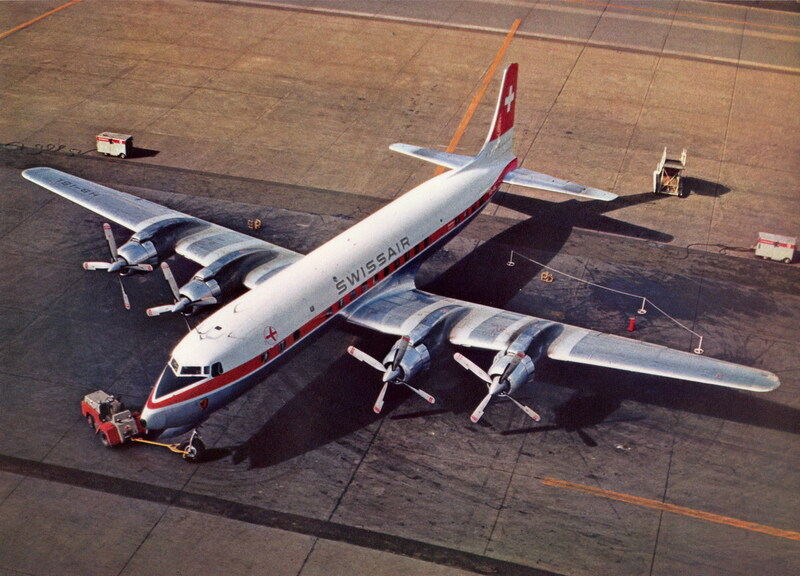 . . it was on TWA . . .I was about 3 . . . . . and I now know it would’ve been a Super Constellation. Other than that, our summer treks from SFO to STL on TWA were B-707’s, or Convair 880s (an occasional 727 and once, in 1974, an L-1011) . . . . . TWA flew the Convairs well into the 1970s . . . . loud, polluting and sucked fuel, but the 880’s would cruise at over 600mph . . . Somewhat curiously, when we first moved to IC, Ozark was servicing it with DC-3s, and then the Fokker. But commercial service to IC ended within a few years. Yes, I loved the old CR terminal, with that big rotating(?) globe in the lobby. I’d sometimes drive up in the early seventies just to get a bite to eat in the cafe and hope to catch some plane action, inevitably a 727 or 737 from Chicago. 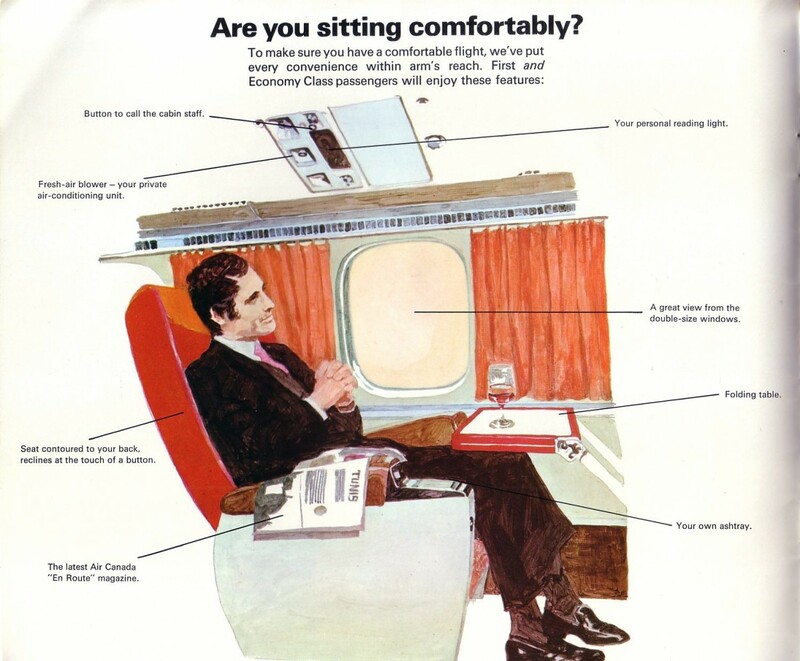 Regarding that “Are you sitting comfortably?” ad: Is that window size for real??? 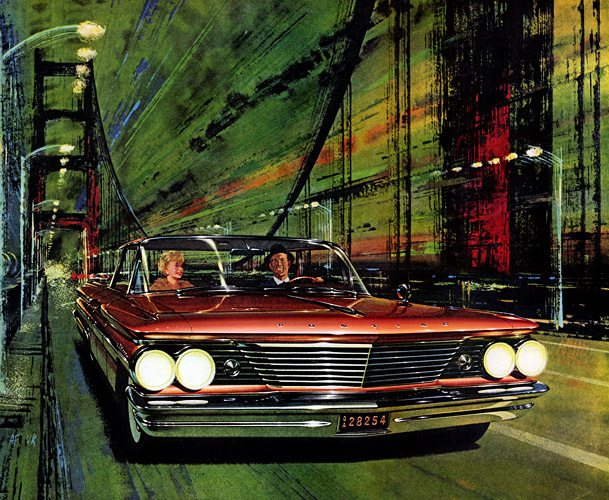 Or is it the aviation equivalent of a Pontiac Wide-Track ad? The windows are what I remember most from my DC-8 flights in the 70s. They really were huge, and had sliding curtains instead of plastic shades. The remark about the windows being spaced for a 40″ seat pitch rings true. I recall my bitter disappointment on one flight when my “window seat” had nothing but a blank wall. Nice story! You do a good job of describing how a situation and trip like yours would be something that would put a 7 year old boy’s brain at risk of melting down from excitement. I was particularly struck by the comment that your dad liked the U.S. based on his POW experience. Is there another country in the history of the world that has POW’s come away from the experience loving the country and wanting to move there? I love America! I’d be interested to hear anything you can give on what exactly his experience was. Britain was proud to accept many POWs as citiizens after 1945. Good point, that is the one other wartime country I could picture that in. He was captured near Normandy, spent some time in POW camps in France where the conditions were poor and the food inadequate. As a medic, he worried about his ability to survive, given the rations. (He had a high metabolism). Not that many POWS were sent to the US. Fortunately, a contingent being sent there was short a medic, so he was plucked out of his group and got to go. The war was essentially over, so he was sent to Kansas and Colorado to tear down military training camps no longer needed, including Camp Hale in the Rockies. In Kansas, they had the option of working on local farms, for 10 cents per day pay. He was glad to do it, especially since the home-cooked farm meals were exceptionally good (camp food was adequate). On a drive through Kansas in 1970, he pulled off the highway to one of the farms he had worked on 25 year earlier, and knocked on their door. It was an old couple, and they couldn’t exactly remember him specifically, but were thrilled that one of “the German boys” had come back to visit them. He was the only one who had ever done so. He was repatriated in 1946, and came home with many happy memories, especially the beautiful Rocky Mountains. We vacationed there often, in later years. 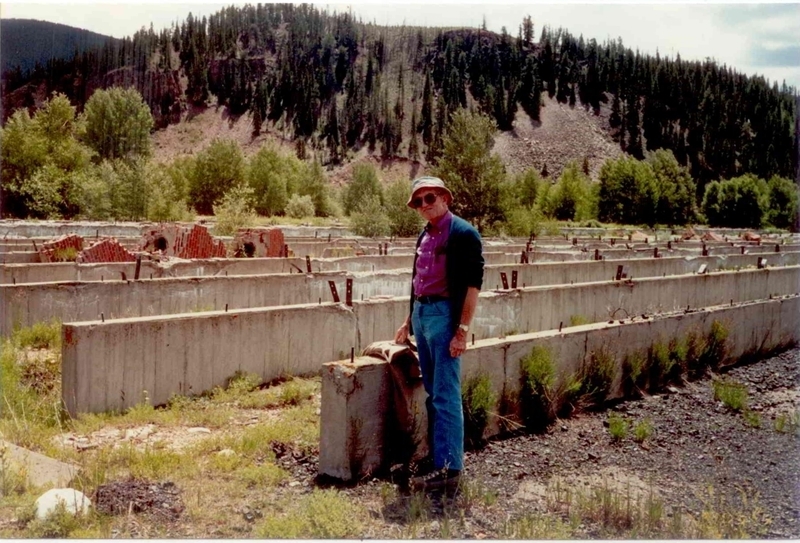 Here’s a picture of him at Camp Hale in 1990, where he had torn down the barracks in 1945. The foundations were still there. Great story. Your father’s positive experiences were hopefully quite typical of many of the German POWs sent to the U.S. My father did his Air Corps basic training at a camp in Colorado, and my half-brother’s father was a barber at a prison camp in CO. I had a German cousin who was captured by the Russians at Narvik and didn’t return from Siberia until 1947. I remember him visiting in the mid 1970s and lamenting the fact our speed limit was only 55! I read the obituary, you’re dad seems like a father to be very proud of. Hopefully your mom came around to seeing his wisdom in moving to the U.S.
Canada as well….my Grandfather employed German POWs on his farm many of whom returned after the war. I will always remember my first ride in November 1966 on a jet. 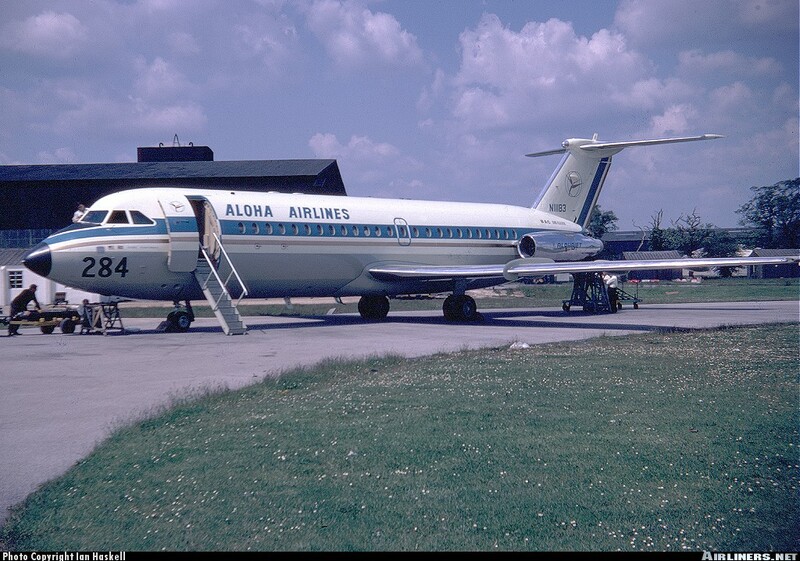 It was an Aloha Airlines BAC One-Eleven, they flew those for about 3 years before switching to the Boeing 737-200 on inter-island flights. What a thrill it was taking off from short runways, it was like a rocket ride going straight up! Great story, and well told. The background on the 707 and DC-8 is deserving of more another day but you should seriously ensure that your family’s history is fully and properly recorded. Between your and your parents’ generation, you’ve obviously seen and experienced so much that should be recorded for future historians, as well as your purposes. I remember sitting in the airport lounge at Las Vegas in 1972, looking out at a yellow and bluish-purple Hughes Air West (727, I think) that had mechanics on stepladders working on one of the engines, and something oily-looking smeared all along that side of the aircraft. I flew out on the one next to it. 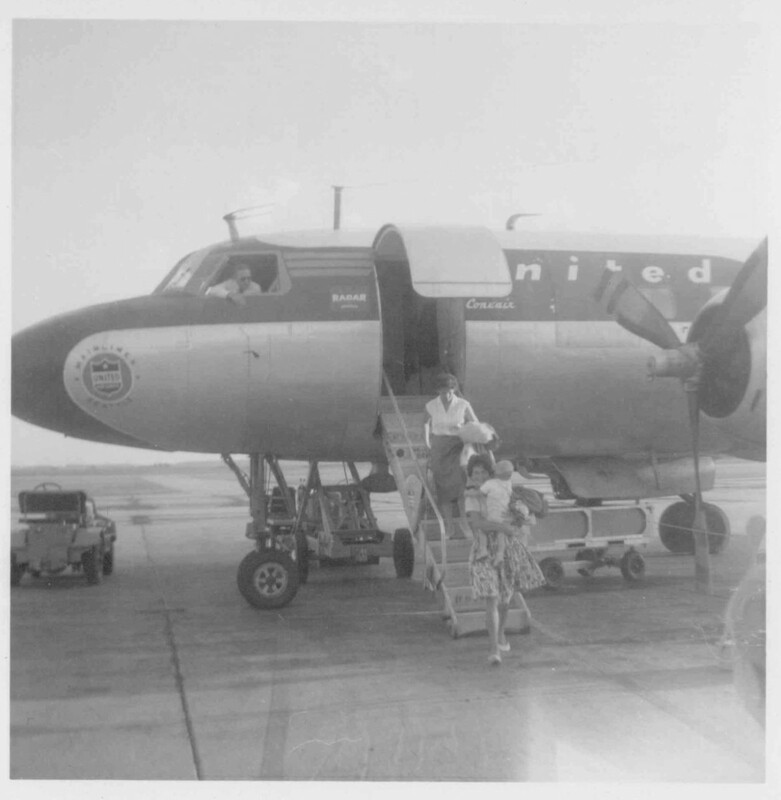 In those days we still walked out across the tarmac to the plane to board it on a movable ladder-cart. On the flight itself I was most impressed with the number of cinder cones that were clearly visible in northern Nevada and eastern Oregon. Great story, thanks for sharing. Just the thing as we slide gently into the holidays. Your recollections are in stark contrast with the ordeal of air travel these days… nevermind, as long as we hang onto our CCs we can just pretend. Oh, of course it’s summer in these parts and some trips are planned – before which I inevitably will list the protocols to be observed: “No questions of time or distance. No consumption of food or drinks within the vehicle. It’s summer, of course it’s hot – remember the Neidermeyers, they turned out fine. Enjoy the ride”. Thanks for another fun and informative year. Thanks for the note on the Comet Paul, but don’t forget the Vickers VC10 as well. Yes, another ambitious but mostly sad tale. I’ll leave it to you, perhaps? Yes, I thought it wrong then and now. Back in the ’50s we were not just head and shoulder but more like a whole torso above the rest of the world. New immigrants arrived to see a new world that’s so much bigger, better than wherever they were from, immigrants couldn’t help but in awe of the greatness. Fast forward 60 years, I am quite sure for immigrants from say Shanghai or say Singapore, the feelin’ might be quite different. We have not been investing in our infrastructure, heck, we didn’t even maintain our infrastructure. Those new immigrants will arrived to see an old and not tidy airport, smallish in comparison to the one they departed from. Great story! Written with care, as befits the emigrant/ immigrant tale. Most of us will never know the competing emotions of those who leave their birth land for another, and are often caught somewhere in between. I was recently told that a family of German descent that lives in my area was started here by a former POW. Camp Shanks, the largest embarkation camp in the U.S. during WWII was located on land that surrounded the Dutch sandstone colonial building that is now the Blauvelt Free Library, where I work. The camp also housed prisoners of war, a few of whom evidently managed to slip though the basketweave of red tape and resettle here after the war. I don’t recall my first commercial airplane flight, but though I’m older than many in this forum, my experience was almost entirely jets, with only a couple of Eastern shuttles flown on Electras to spice it up. As a paper boy in the years surrounding 1960, I was magnetized by stories in the my NY Daily News deliveries about the infamous crashes of Electras brought on by cracks in the engine mountings from hard landings. Always liked the planes though, with their stubby wings and long, graceful nacelles. I recall the MD-80 regional flights from Allentown-Bethlehem-Easton Airport in the early aughts as somewhat tight, especially for those who got window seats and could not stand fully erect under the overhead compartments. These days, it’s almost always a wide body 737 between Newark and SeaTac. However, I did get a round engine ride in a Grumman Goose tourist plane on Lake Union, WA in 1995. When we skimmed into the dock, the pilot hit the mooring hard and blurted a colorful string of expletives. Debarking, we kept our mouths shut about the 3 inch hole he had punched in the nose. We figured he was embarrassed enough, but wondered among ourselves if he had hit a watering hole earlier in the day before hitting the dock. We used to have over 3,000 color slides of family movement… trips, vacations, work related stuff. I volunteered to be the keeper, and recently culled out three quarters of them that had no family value because none of us were in them. Used to be, you would force your neighbors to look at your vacation slides, many of which were shot AROUND the family rather than with them. The net makes that style of photography a quaint artifact. Since joining our blog family, I wish I’d kept more of the car museum pics from 1955, though! A few comments up, I left some more info on my father’s POW experience. I flew a DC 8 one time, in the late 80’s and remember being quite anxious about it. Something about those widely spaced windows on the stretch didn’t appear right to my eye…and this was at a time shortly following the Arrow Air DC 8 accident in Gander. And the model was getting rather long in the tooth. Not a happy flyer that day. I have since accumulated 1.5m miles and just flew today LAX-EWR upgraded to seat 1B,(thanks United!) on a 757, my current favorite. Like the DC 8 stretch, long, lean and proud with fabulous take off characteristics. I love old Douglas-built planes. There’s something quaint about seeing extra eyebrow windows on a (somewhat) modern airliner. My most memorable airline flight was on a Grumman Mallard (N2969) from Miami to Bimini and back again in 2003. It was amazing to land on the water and then taxi back up onto land. It was a beautiful airplane. Sadly, it went down two years later due to a fatigue crack in a wing spar. My first flight was a Douglas DC 9 with Hughes Air West in 1971 from Eugene to Phoenix. All I remember is that the jet engines were really noisy, especially sitting in the back. I’d like to hear more stories about your dad, especially his POW experience. I left some info on his POW experience a few comments up. Nice article and the line up of planes at JFK waiting to fly is surreal. The talk of old planes reminds me of the Airbus A320 I flew on from Las Vegas to Philadelphia today. The interior looked rather outdated and somewhat worn. I had to get a club soda to wash my hands since the faucet was not turning on, there were no TVs in the seat backs, and the trays did not have an indentation for soda cans. Always thought DC-8s were cool jets. Not the prettiest airliner…kind of gangly looking, but with a purposeful grace all its own. Last time I recall flying in one was in 1982, and I was 21 years old. Flew a JT3D powered United DC-8-63 home from scuba diving in Cozumel to Miami in winter of ’82. Later that summer, flew a CFM-56 powered charter DC-8-63 home from a Navy midshipman cruise, from Hong Kong to SFO via NAS Cubi Point, PI; Kadena AFB, Okinwawa; and Anchorage, AK. Didn’t mind all the stops since we got off the plane at each. Memorable trips, both. Great story on air travel from a different era. 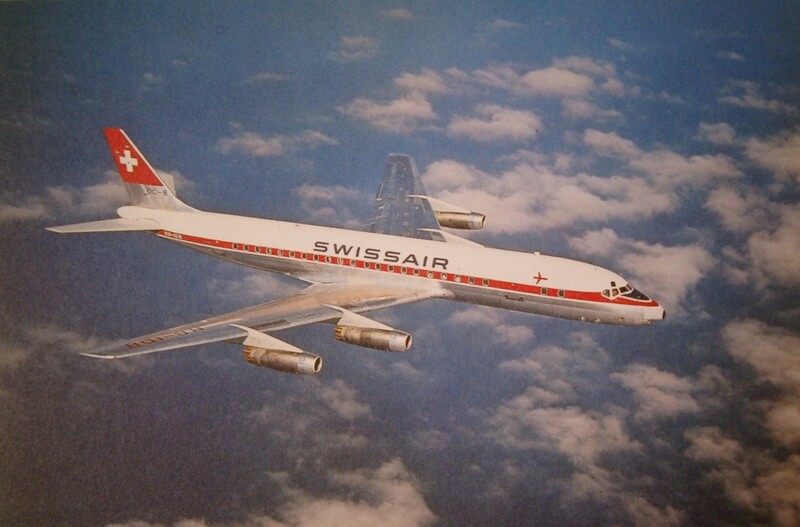 I flew a Swissair DC-8 at age 11 in the opposite direction in December, 1969, from Detroit to Geneva, Switzerland, with a stopover in Lisbon, when my Dad was transferred to Geneva with Chrysler. I had the reverse culture shock – all those strange little cars! Being a car nut, I soon figured out the brands and models, just in time for Dad to be transferred nine months later to London, when I had to start all over again with the British cars. This reminds me of when we brought our adopted son home from Romania in 1990. We grabbed the first flight we could get from Bucharest – it was on a Tarom 707. They had painted it with a brush – you could see the brush marks when you were boarding. The first class seats were removed so your carry on luggage could be store there – you just threw it on the pile. I was very apprehensive but it was a smooth flight to Chicago. Tarom made two runs a week to Chicago with that plane until 1992. Wonderful story Paul and excellent pictures as well. 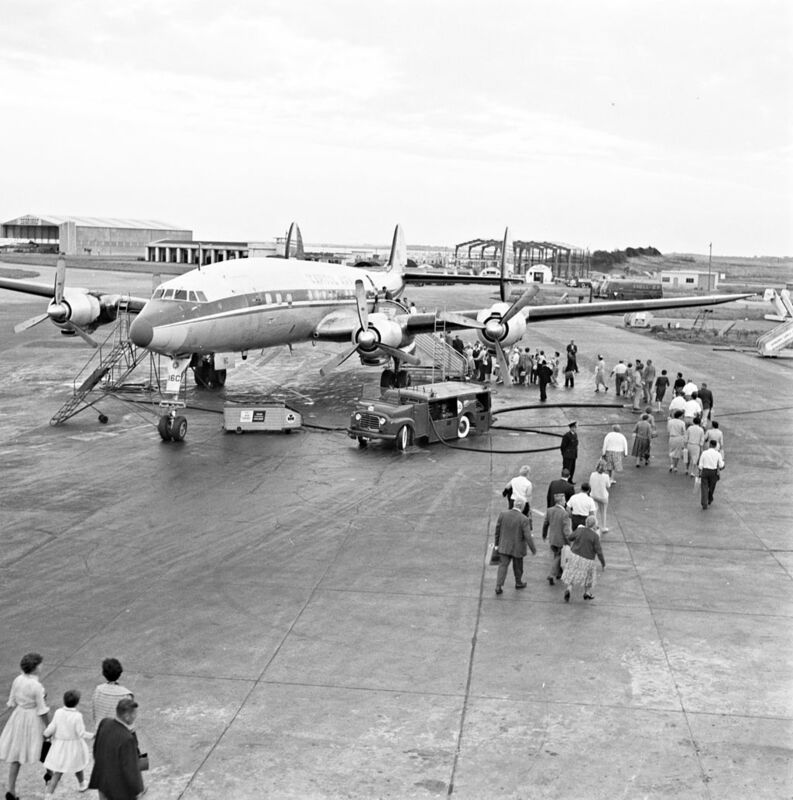 There is something about old airport photos are I just love. And the younger the kids are, the more excited they are about the whole thing. We had a similar experience with the family members left behind when we moved from a town of 5000 in southern Germany to the Los Angeles Suburbs in ’81. Although I’m the same age as Paul, I had to wait until 1975 for my first flight, from Toronto to Amsterdam on a 747. It was a charter flight on Wardair, a small Canadian charter airline. We arrived at the airport early, and we were offered seats on the upper deck – being a charter, there was only one class, and no pre-assigned seats. What a wonderful first flight! It’s the closest I’ve ever been to the private jet experience, with only about 18 seats on the top deck, along with a large semi-circular sofa and a bar! Because of the curvature of the fuselage there was enough room between the seats and the windows to lie down and catch some sleep. Service was excellent – real food, drinks, glasses, plates and cutlery (yes even metal knives!). Fascinating post–both the jets AND your family’s story, thank you for sharing. The foundation of the story is your father being a POW in the US. With out that–who knows. That said, I’m amazed that the US sent German POWs to the US. The Army would not send dead Americans to be buried in their homeland–not even Patton AFTER the war, probably because of “cost” (not just financial–but the transportation capacity was probably very limited, though right now I’m thinking, full supply ships land Europe with men and material and go back empty for the next load…). It seems to me it would have been a lot cheaper to have some angry Frenchmen guard them in France. The Germans were not exactly beloved–and the French and western Europeans had it 100x better than the Greeks and Serbs who actually resisted, or the Poles and other subjugated peoples of Eastern Europe who did not hate Stalin enough to cooperate with Germany. Then again, perhaps the US figured that a U-boat might think twice before sinking a freighter full of Germans. At any rate, life is funny. Sometimes out of bad events, good things come. In this case, like many others, your father was captivated by the “new world” which ultimately led your superb curbside classic web contributions which I enjoy. Thanks again for another interesting and thought-provoking piece! I can’t exactly say that him having been a POW in the US was the primary motivation for the move. He was recruited, and somewhat unexpectedly. And he was frustrated with the politics in his department at the University. He had come close to taking a job in Germany too. It would be more accurate to say that his experience in the US made him more amenable to the idea, as well as giving him some idea as to what it would be like. I don’t know the actual numbers of POWs sent to the US, but it was not large. I can’t really say what the motivations were. But yes, there had to have been plenty of room on the ships returning back to the US. Canada also had POW camps, with about 30 000 prisoners by the end of the war. I think the first large groups transported were Germans and Italians captured in North Africa – which would make sense given England’s marginal situation at the time and France still being occupied. North America was likely the only place to send the first POW’s in any number. My father was in the British Royal Tank Corps, and was himself captured in North Africa, spending 3 years in POW camps in Italy, Germany, and Poland before escaping with a friend in the general chaos in the spring of 1945, and lying low for a few days until the Russians arrived. What a different world our parents lived through. I recall reading that food and other resources were in desperately short supply in Europe in the late-war/early-postwar period, and it was calculated that instead of shipping food from the US to feed POWs it was more economical to bring POWs to the US, where food was more abundant and farms were short of labor. It was amusing to read that your father had a positive experience as a POW, a very rare situation in the history of warfare. I’d say that for a professional with multiple opportunities, which to me at least sound pretty good–sound terrific relative to the average German/Austrian circa 1960, let alone the average European, to embark on an adventure and relocate his whole family, at the very least, shows at a minimum how fairly positively he viewed the US. Which I think is great! America still has a lot to offer an Austrian/German professor today, but I don’t think it is as enticing for a current “Dr. Niedermeyer” as it was during the post-war period. Our ‘shine’ is a duller now, and not only is the rubble and rationing long gone, Germany’s stock is way up…for now, at least. I think America’s ‘golden’ eras were the 1920s, and 1945-1965, your story in several ways reinforces my view, as your recount the dawn of the jet age (an American innovation, really) from your unique vantage point and personal journey. BTW, I was born in the mid 60s. Interesting point… I can think of a number of my work colleagues here in Austria who would consider relocation (as opposed to a temporary stay or a long holiday) to the US as strange and not very attractive. Times have changed indeed. Very enjoyable article Paul. I’ve always preferred the lines of the DC-8s to the 707//720. Only ride I had on one was a hybrid cargo version; seats removed in front 2/3s with about 16 fairly spacious seats in the rear. Was used as a military contract flight in the far east. Had the CFM 56 engines, which really allowed it to get down the runway and up in the air. In contrast, one of my first rides in my USAF career was in an old A model KC-135 with the water injected turbojets – everyone in that plane, to include the pilots, prayed that it had enough speed to lift off before the end of the runway…. Really enjoyed you and your family’s history also. Great article Paul, I think your personal journey & experience is what makes your writing so complelling. As a child of European immigrants it strikes a chord for me. My father was an Air Canada pilot, so I grew up flying standby. I can just remember early trips from Vancouver to London on DC8s with open luggage compartments and reading lights mounted in the headrest. Re aircraft windows: The Vickers Viscount might have the best. Much larger than B707 or even DC-8. “The Viscount’s cabin windows were ellipses measuring 19 by 26 inches”. (Wikipedia) Recall being impressed with the view while flying from Hannover to West Berlin in the 1960s on BEA (British European Airways), to avoid traveling on the East German controlled transit Autobahn. My first flight was on a DC-8-40 of Trans Canada Airlines, on 25 April 1962, which became Air Canada two years later. We were moving to Edmonton, Alberta from Montreal. Six years later left on one headed east moving back to Montreal. Had another short one on a -61 YYJ-YVR all of 39 miles with Air Canada in August 1980.Did not have another until September 1987 when it was on a NationAir charter for thte Canadian Forces, from Vancouver to Ottawa, a milk run with stops in Edmonton and Winnipeg. Nasty filthy plane that rattled, a -61 I believe. I realize this is a rather old post, but I wanted to say ‘thanks’ for a great article on your experience. I first flew on a DC Stretch 8 with the fabled ‘hippie express’, Loftleidir Icelandic. These flights had but one class: cheap seats. There were no intermediate bulkheads that separated the unwashed masses from the elite, so the cabin was very, very long. 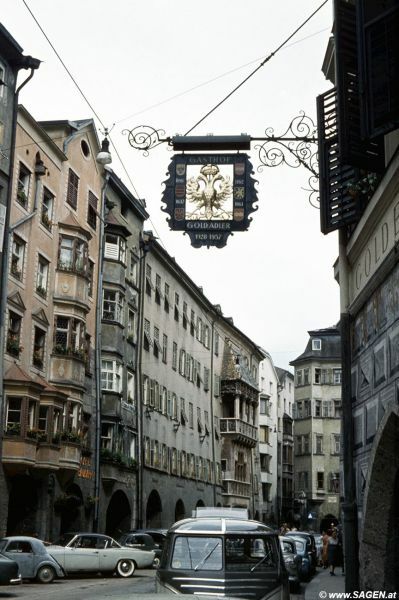 Our ultimate destination was to meet up with my friend’s girlfriend in Salzburg and hike through Europe. It was a very cheap flight ($365, JFK to LUX, round-trip) and it introduced me to the wonderful people of Luxembourg. After the Greyhound bus ride from Detroit to NYC and the usual wacky bus passengers, the Stretch 8 was luxurious! I will never forget sitting toward the rear of the stretch 8 as it took off from JFK. I was watching a stewardess in the front struggling to climb the aisle toward the front bulkhead. From the back of this unusually long and skinny plane, she looked like an ant. She used seatbacks as handholds and turned her high heels sideways for traction as the plane took off at a rather steep pitch. Returning to the US, the landing in Reykjavik was very memorable. My friend and I were bombed on cognac when the plane bounced several times as it touched down. It wasn’t a hard landing but it was alarming. Every time the plane bounced, it came closer to the edge of the runway, almost disappearing under the fuselage as the grass sped by. We busted out laughing when about half of the cabin simultaneously reached for the barf bags. We had no idea what might have happened if the right side landing gear had dug into the soggy sod. In retrospect, considering the front and rear overhang of this very long plane from its landing gear, it was miraculous that disaster was averted. The ground crewman with the two orange flashlights was standing at an angle because the rain was coming down almost sideways! We were not permitted to de-plane on the layover. Thanks again for re-kindling memories of flying in the 60s.